Our previous camp-out in early April at Grove, Oklahoma Cedar Oaks RV Resort gave us lovely sunsets, time with the Dean’s RV Camping Club and lots of good food at local restaurants. We left Grove on Sunday to meet up with friends, Jessica and Fred at their cabin in Flint Ridge, Oklahoma to see the dogwood’s in bloom. This is a natural setting on the Illinois River and we were alone in wooded solitude. We were invited to meet up with them again in a couple of weeks in Locust Grove, Oklahoma to dance to the country swing band The Tulsa Playboys. 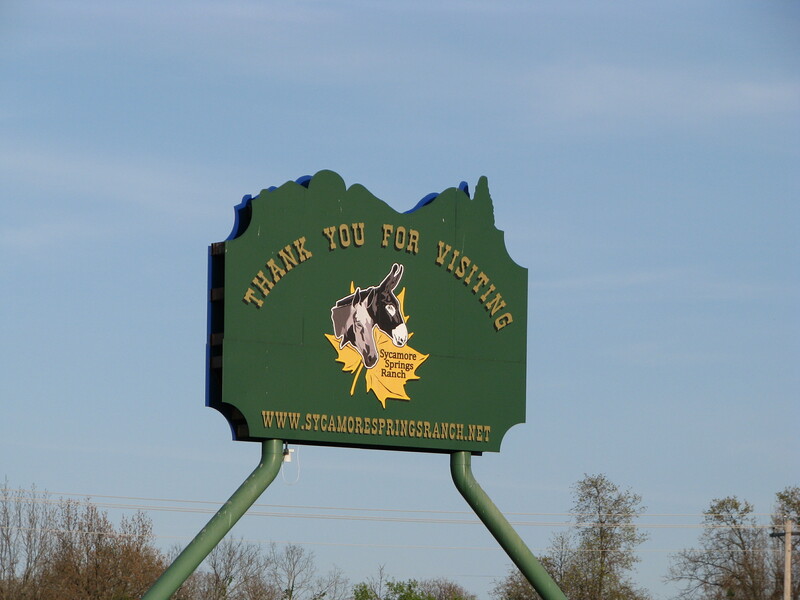 The event was to be held at Sycamore Springs Ranch in the Mule Barn. The website indicated that on-site RV parking was available and scanning the activities for the week-end we found that a high school rodeo would be going on Saturday and Sunday and the United Bucking Bull Inc. (UBBI), Gold Standard and Diamond Futurity would be held on Friday and Saturday. We decided to book our RV spot for both Friday and Saturday and check out the events. 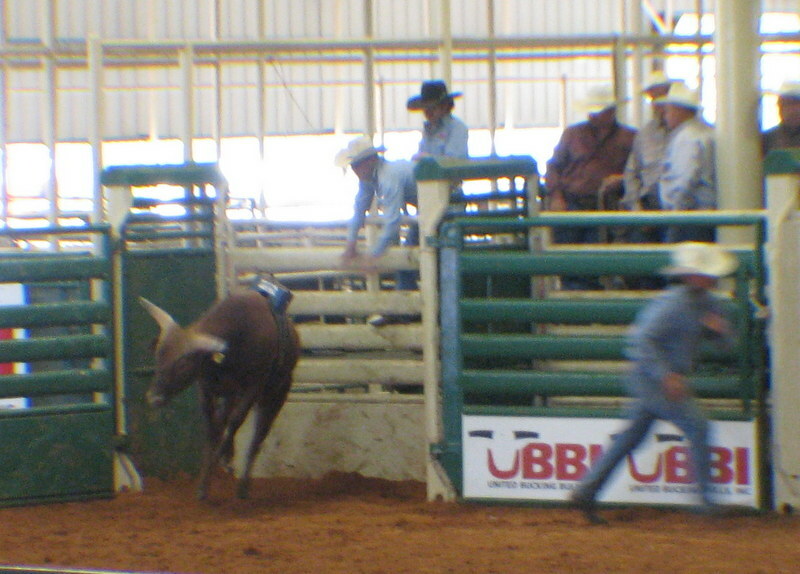 This is a large sophisticated cowboy ranch with capabilities to host multiple large events. The facility includes an outside arena, an inside arena, stalls and corrals for stock animals,entertainment halls, cabins, RV sites, bath houses and exotic wildlife. The RV Park (with FHU) area was full for the week-end. The area nearby became a dry-camping area with horses grazing the green grass. The inhabitants were long stock trailers for the livestock with RV quarters for the people. Horses grazed the grassy areas nearby their home trailers where cowpokes and their families gather for supper by the campfires. We had never been in such a park and found it fascinating. This group was friendly and polite to us and the camaraderie among them revealed their strong community ties. It was a western storybook come true. We had no idea of what the events would be like since we are city slickers. However, we are social ballroom dancers and can do country two-step and country swing dancing. We have the costumes (boots, jeans and prairie skirts, etc. ), we sort of looked like we could belong there. The Mule Barn is where large inside people events are held; conventions, weddings, reunions, etc. It has a beer bar, catering facilities, a mechanical bull, a stage and a good-sized dance floor (painted concrete). The Tulsa Playboys are a fantastic country swing dance band of 10 to 12 band members. They perform at the Tulsa Cain’s Ballroom and other Tulsa area venues. The UBBI event was the highlight of the week-end for us. We happen to camp in the RV park next to one of the participants and they were helpful in explaining the rules and purposes of the event. I won’t try to pretend that I understood it, but this is what I discerned unofficially: The bulls (yearlings and two-year old’s) are corralled into a shoot, strapped with a dummy (weights) and bells on their back and then released to the arena. The idea is that they will come out of the shoot, bucking up a storm in a wide circle and hoofs upward and outward, showing lots of attitude for five full seconds. A panel of judges score the bulls on their five second run. Winners with the most points are ranked with cash prizes and payouts, first prize overall was $50000! It is obviously big business as we thought that we observed several buys and sells as the bulls showed their stuff. These are some of the bulls that are supplied to various bull riding events all over. A highlight was that our camping neighbor’s little six-year daughter, Mayson and her pony carried the American Flag during the opening ceremonies which included our National Anthem. She and her pony did a fine job, it was obviously not her first rodeo type event. The high school rodeo was exciting with youngsters vying for position and points with their roping and riding skills. The horses were gussied up with braids, beautiful saddles, and beautifully outfitted riders. The skills were impressive and the organization of the activities professional. Good horsemanship and good sportsmanship was the norm, not the exception. It was a fun day! We headed out early to miss the Oklahoma spring storms threatening the skies. We look forward to more of these serendipitous events as we go forward to our dream of full-time travels in an RV.